Another tough week in terms of busyness, and pressures, but I think everyone I know in the voluntary sector is in the same boat. I attended an excellent Business Skills course on Monday for Surrey Youth Focus members, run by Proctor and Gamble at their very smart training centre in Weybridge. The presentations were very good, and to my mind two were outstanding. There was lots of good advice and challenges for me to think about. I think another course may be run – covered marketing, communications, and social media. The key learning point for me was just how customer focused P&G are; whilst we are not selling shampoo, we are also in a people business, and I need to work out how to make the time to get closer to our members. Talking of which, I ran the second business planning session with one of our member organizations yesterday evening – the Barn Youth Project, Park Barn, Guildford do outstanding work. Voluntary sector chief execs met with the Leader of Surrey CC, Andrew Povey on Monday about issues between the sectors; I pitched my favourite subject of social impact bonds and the particular proposal we are putting forward to a meeting with the Council’s Chief Executive David McNulty on 9 Feb. Interesting to see increasing media questioning of whether “The Big Society” is deliverable – this was even the subject of a Times leader this week. My own view is that it will be a close run thing between the atrophying of the voluntary sector as a result of the cuts – I see for example that Vinvolve are closing down at the end of March – and taking the opportunities under The Big Society. For example Surrey CC’s Assistant Chief Executive explained to the Surrey Community Action meeting on Tuesday evening that the Council are now offering up the 11 least used libraries to be run by local communities. It is easy to be cynical about double devolution (from central to local government, and on to the voluntary sector ) but the alternative may be that services are closed altogether. I hope the voluntary, community and faith sector will take up the opportunities offered, and innovate out of the mess UK PLC finds itself in. Crucial in all this will be the willingness of the corporate sector to invest in social projects during these years when government funding is in decline or moribund. Personal disclosure/ parental pride: One of my sons is running in the London Marathon (and hosting a charity lunch at his restaurant in London) for a charity called The Railway Children being for destitute children in India who live on the railway tracks as he saw to his shock when he travelled round India for two months a couple of years ago. a) Answer: Ed Balls and Yvette Cooper are indeed the first husband and wife team in a (Shadow) Cabinet. b) Question: Why is Rupert Murdoch so angry this week? It is very evident to me that there is a strategic need to engage very closely with potential corporate funders, and build that relationship. This was in part the theme of RAISE network meeting in London on Thursday with presentations by the CEO of NAVCA, (Kevin Curly) and by the inspiring CEO of The Big Society Network and The Square Mile (Paul Twivy) . The latter being particularly interesting. All the reports/ presentations mentioned here will be on our website next week (on Monday/Tuesday). And finally I can’t forget that there are now 950,000 young people unemployed, though surprisingly the number in Surrey is still going down (as at December 2010), and that the education maintenance allowance is to be abolished, which will I think have a very adverse effect on continuing education of 16-19 year olds from low income families. Don’t forget to book into our Faiths in Action conference for young people on 23 Feb – see website. Personal disclosure: As I was berating Goldman Sachs for its average salary/ bonus of £230,000 I learnt today that they have just given a decent sum to one of our member organisations. Two sides to every coin. 1) Last weeks answer: Wikipedia is now 10 years old. 2) This week’s question : Has there ever been husband and wife team in Cabinet or Shadow cabinet before ? (ie like Ed Balls and Yvette Cooper) ? I attended the funeral of Patience, Lady Baden- Powell on Monday at a packed church in Albury her village. She was our President and a very special lady who managed to reconcile a long colonial experience, love of tradition and faith with complete modernity especially regarding young people. It was a very positive celebration of a full life of service. She will be much missed. Well the Year has started at a fast pace, and everyone I talk to in the voluntary sector seems to be setting a deficit budget for 2011/12, unless they have fixed contracts, and there are widespread concerns. There is also an interesting government website (central and local) that has been drawn to my attention assisting public authorities in making spin off services ( co-operatives, mutuals, social enterprises) and with the prospect of Big Bank funding. Their recently announced focus is on….youth services. The site is www.localpartnerships.org. I have been lobbying Reigate and Banstead Borough Council in support of the Scots about the closure of the swimming pool at Banstead. We have an Interfaith event for young people (free) on 23 February in Leatherhead – booking details on website – with food and entertainments. Funded by a Faiths in Action grant. Yesterday, I ran a business planning session with the Trustees of the Park Barn Youth project to develop their future direction. One full time youth worker and a part – timer do fantastic work – they have 250 young people on their books and regularly have 50 young people to their sessions. Voluntary organizations just do amazing work! Personal disclosure: I have banged in my third set of assignments for my part/time MA Theology, so I’m feeling…virtuous… won’t last long..
Best wishes for the New Year…which will be a challenge. I am tempted to say that the key to success will be sleep, for I know that a lot of people are already, and will be, working very hard during this year to sustain their services as “the age of austerity” falls upon us. The County Council’s reorganization of its Youth Development Service was approved by its Cabinet on 21 December, and now moves to an implementation stage, where the devil will be in the detail. 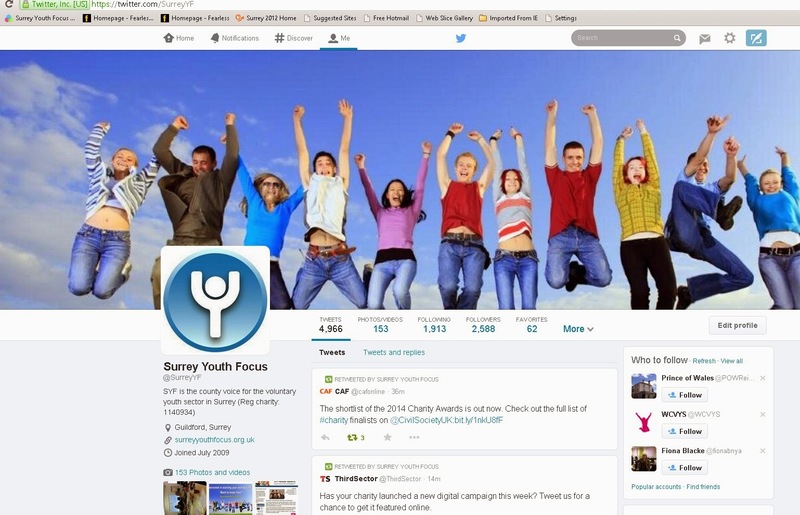 We are losing funding from Surrey County Council for Surrey Youth News in 2011/12, as part of their cuts package, but we will definitely be continuing with Surrey youth News regardless, by finding other sponsors, or at the least by producing SYN in electronic form. In Surrey Youth Focus we are already doing a lot to address the core issue of funding and to refashion ourselves. The new Business Plan will go to Trustees on 8 February unveiling that strategy. This will include being far more explicit about the support services we offer to members. I am delighted that two staff from Surrey County Council (Saba Hussein and Ben Skipp) are being seconded to us to work part time on several projects, but principally on the development of social impact bond projects (see website) from our members, and then assessing the implications for Surrey CC. I keep saying that the only way that services to young people will be maintained will be through innovation and collaboration, so this secondment initiative is very welcome. We have a Faiths in Action event on 23 February for young people and adults(see website), and I met with the Chief Executive of the London based Desmond Tutu Foundation who do great reconciliation work with young people – for example with young people in gangs. They will hopefully become members of ours as they extend services into Surrey . Personal disclosure: Had a Boxing Day visit to a very cold Wembley Stadium on Boxing Day, despite the tube strike, to watch a rugby match with one of my sons –my team (Wasps) lost! Trivial pursuit: Has to be about the glory of winning the Ashes in Australia …..what records did the England Team break on this tour?